Is Revver On The Fritz? We’ve been getting a lot of tips from people who have been having problems reaching the Revver website lately, getting videos uploaded or playing the ones already hosted on the platform. We haven’t paid much attention to them so far, because every time we check, the site appears to be running smoothly and we experience no trouble playing videos. But a quick glance on Twitter shows something is definitely up. What’s worse than uptime issues, though, is that the company apparently has some trouble meeting payments. Rumors are circulating that employees haven’t been getting their paychecks on time either, adding to the assumption that Revver is now on its last legs. Revver, founded in 2004, was one of the first video sharing sites to start sharing revenue with content creators. In September 2007, everything looked rosy when the company said it had managed to pay $1 million to video producers and their affiliates over a period of one year. By February 2008, the company was collecting debt, laying off staff and reportedly put itself up for sale. Revver was in fact acquired nearly two weeks after our post, by MySpace founder Brad Greenspan‘s LiveUniverse for “about $5 million“. Revver had raised a total of $12.7 million in two rounds from Comcast, Turner, Draper Fisher Jurvetson, Bessemer Venture Partners, Draper Richards and William Randolph Hearst III. 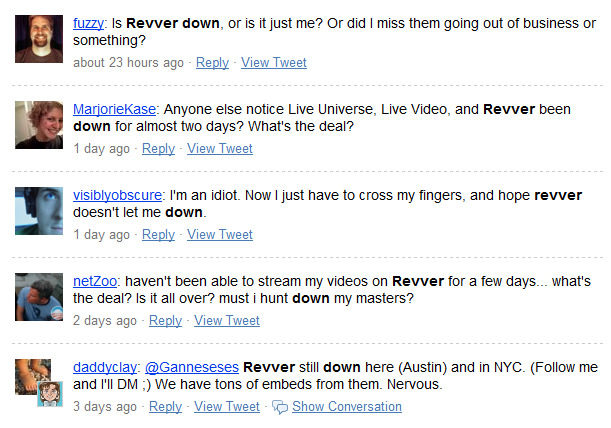 But now it seems Revver is on the ropes once again, and may be headed for the deadpool soon. I also can’t help but notice that the LiveUniverse website doesn’t even mention the social video property anywhere, not even in its media kit. We have an e-mail in with Greenspan asking for more information and will update the post if necessary. Update: Greenspan checked in and says they are in the middle of major migration from a CDN/provider to a tier 1 & top technology provider which “should make the quality of Revver videos displayed better then ever” (could take a few days). No word on the complaints about actual downtime and delay or lack of payments to content creators yet, so we’re sticking to the story.